A great way to start your morning or a great dinner idea! Yep, I have another blueberry recipe. I know that my last post was also about blueberries, but it is blueberry season and blueberries are cheap. I am a big fan of pancakes. 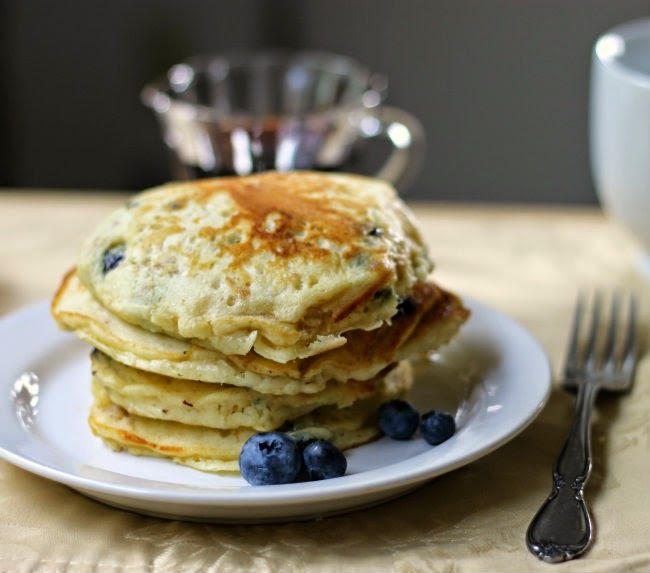 Blueberry pancakes are probably one of my favorites. Usually I just make my go to recipe for pancakes and sprinkle blueberries on top of the pancakes once they are frying in the skillet. But today I wanted something different. I have been using a lot more oatmeal in recipes of late. I love oats in scones and muffins, so I decided to try them in pancakes for the first time. The pancakes turned out fluffy and full of flavor. These would be great for breakfast, but I actually made them for dinner. For some reason I love pancakes for dinner. 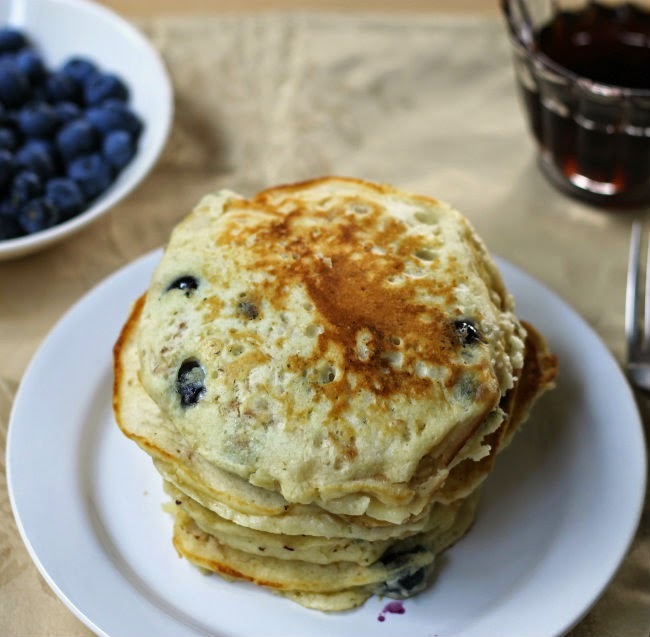 If you love blueberry pancakes, you will have to check these out. 1. In a large bowl combine flour, oats, sugar, baking powder, baking soda, and salt. 2. In another bowl mix together sour cream, milk, butter, and eggs. Pour the wet mixture over the dry ingredients and stir unit just moist. 3. Add the blueberries and gently toss to combine. 4. Preheat griddle to 350 degree F or a skillet on the stove over medium heat. 5. Coat the bottom of a skillet or griddle with a small amount of butter. Scoop about a 1/3 cup of batter onto the skillet. 6. Cook until the bubbles appear on top and the bottom is nicely browned. Flip pancake and continue to cook until the other side until browned about another minute or two. 7. Serve with your favorite syrup or toppings. I bet the sour cream in these adds some great flavor and fluff…and I’m always up for bluebs in my breakfast! I’ve had blueberry pancakes before, of course, but the addition of the sour cream and the oatmeal sounds intriguing. I better hurry before all of the fresh blueberries are gone. 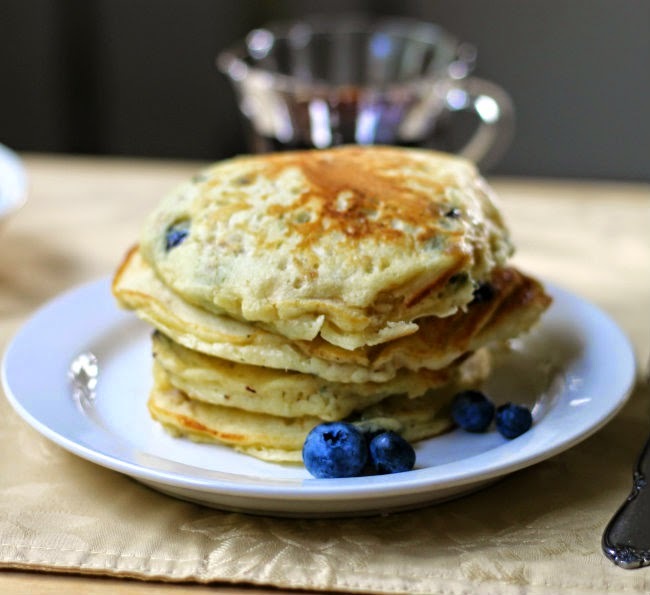 These pancakes look so good Dawn, specially with oat and blueberries…I yet have to try adding sour cream in pancake batter…thanks for the recipe. Can never have too many blueberries! I considered making a blueberry cookie with sour cream recently, but when the more traditional route. These look great! Can’t have too many blueberry recipes at this time of the year! It’s been an amazing year for them — really good quality, really good prices. Love them in pancakes, and yours looks terrific. Good recipe — thanks so much.